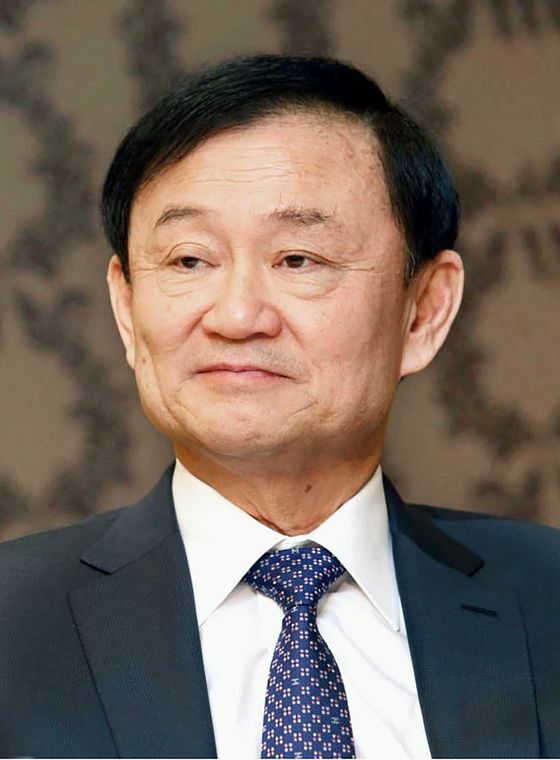 (Bloomberg Businessweek) -- Thaksin Shinawatra hasn’t set foot in Thailand since he was convicted in a corruption case brought after a 2006 coup that deposed him. But in the poor northeast, the billionaire former prime minister is seemingly everywhere. On a sweltering March day, pickups full of farmers wearing straw hats and carrying umbrellas clogged the roads heading to a rally in Khon Kaen, one of the biggest cities in a region that’s helped Thaksin’s allies win every election since 2001. Speakers for the Thaksin-linked Pheu Thai party invoked him repeatedly in speeches, and supporters wore T-shirts depicting his sister Yingluck, who was ousted in a 2014 coup. 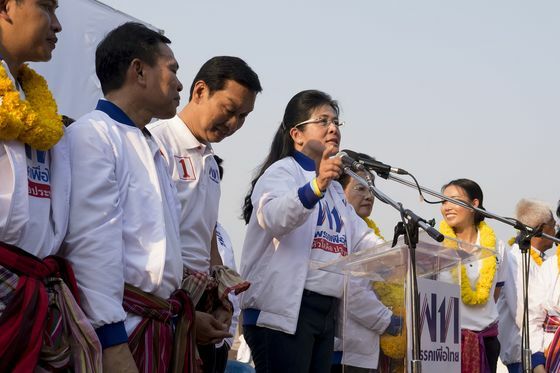 Sudarat Keyuraphan, a former cabinet minister under Thaksin who’s one of two candidates leading the polls in the race to become the next prime minister in the March 24 election, jumped on a motorcycle to make it to the stage on time. “We believe in the majority of farmers, in the little people,” Sudarat says in an interview, echoing the message that endeared Thaksin—who, as an exile, is forbidden from direct involvement in the election—to working-class Thais. The vote will again test whether Thailand’s rural masses repudiate its coup-prone generals, who’ve ruled the country since seizing power in 2014. Thaksin’s opponents—a loose faction of soldiers, bureaucrats, and wealthy Bangkok families with royal connections—have used the military and the courts to invalidate the results of the past three credible elections and to remain in power. This time the military has a greater say in who will assume power: A nonelected Senate handpicked by the ruling junta will get a vote for prime minister, making it harder for Thaksin’s allies to form a government, even though they’re set to win the most seats in the House of Representatives. The prospect of a messy result risks more of the same discord that’s led to bloody protests in Bangkok followed by bouts of army rule over the past 15 years. The political battles have hampered economic policymaking and eroded Thailand’s position as a top manufacturing destination in Southeast Asia. Since 2007, Thailand has dropped the most among the region’s biggest economies in the World Economic Forum’s ranking of global competitiveness. Growth is projected to be 4 percent in 2019, according to the Bank of Thailand—less than the 5.2 percent across Southeast Asia as a whole. It’s the seventh straight year Thailand would lag its peers. In the northeast, a vast plateau of agricultural land that’s home to a third of Thailand’s population, voters still laud the populist policies Thaksin introduced two decades ago, including cheap health care and agricultural subsidies. “Thaksin was the first to pay attention to the region,” says Prajak Kongkirati, head of the government and politics department at Thammasat University in Bangkok. Prajak says the former leader’s allies face a tough challenge because of a new welfare plan rolled out by junta chief and current Prime Minister Prayuth Chan-ocha’s government. Conceived in part by a former Thaksin deputy, it offers farmers funds for harvesting and provides low-income earners about $10 per month to purchase household staples. A party backing Prayuth has also proposed lowering taxes, boosting the minimum wage by more than 30 percent, and guaranteeing prices for rubber, rice, and sugar cane. Some in the region are also backing an upstart pro-democracy party called Future Forward, led by Thanathorn Juangroongruangkit, a 40-year-old scion of a billionaire family. 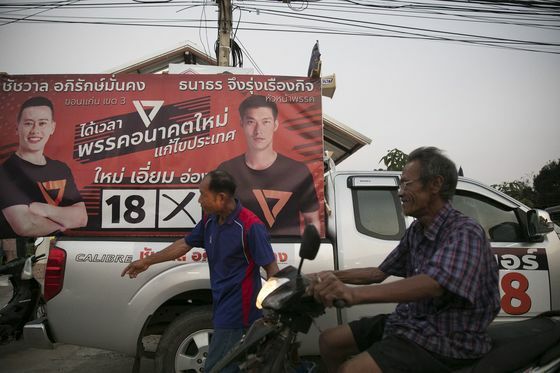 Polls show Thanathorn gaining ground against Pheu Thai. “Democracy is the most important thing,” Future Forward candidate Chutchawan Apirukmonkong says of the new party. Advanced voting was held in Thailand on Sunday, with a heavy turnout of about 87 percent, according to the Election Commission.